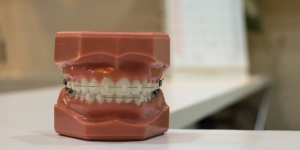 This excellent piece was submitted to us by Dr Amit Pabari of stourbridgedental.co.uk and we thank him for what is a really in depth look at the detailed workings used today in pursuit of bettering the patient experience. The world of cosmetic dentistry embraces all aspects of science and maths in the pursuit of the perfect smile so please read on . Aesthetics is a very important aspect of dentistry, there are many facets which must be combined to achieve an attractive smile. The golden proportion is a geometric ratio that when applied to most areas of aesthetics, arguably gives the most attractive outcome. It is found in many different aspects of not only dentistry, but also in general life, from the Ancient Greek Parthenon made in the 5th century BC, to the width of a double helix spiral of our own DNA. Also named, the Divine proportion by Leonardo De Vinci, the first discovery of Golden ratios is unknown, although we know it was implemented in the architecture in both ancient Egypt and Greece10. The golden proportion was first introduced to the dental world in 1978 by E.I. Levin in Dental esthetics and the Golden proportion11, whose paper gave a range of orofacial proportions that when close to the golden proportion were thought to be aesthetically pleasing. Since then, there have been many studies of comparisons between dimensions of different regions of the mouth. The golden proportion has been related to; the width of upper central incisors and lower central incisors3, the ratio of the length to the combined width of the upper two central incisors discovered by Dr Stephen Marquardt and the ratio of the visible widths of the upper anterior teeth while smiling. This quantification of aesthetics has created almost a template that a dentist can use to determine what size to make teeth, or where to arrange them within a smile. Whether it be rearranging the teeth to be with in certain parameters using orthodontic treatment or creating a new smile with crowns or dentures, the dentist can provide what they deem to be the most attractive outcome using a ratio which can be related to other areas of the face. Some people say that the golden proportion is the wrong proportion for dental use and have created other proportions, such as the Recurring Dental Proportion, which they find suit the use of dental treatment. It is not in dispute that the golden proportion creates an attractive outcome, however it is not agreed upon, whether it produces the most attractive outcome. In this study, I am going to be focusing on the proportion of the visible width of the upper anterior teeth. It has been proposed that, from the upper central incisor, the amount of each posterior tooth visible decreases by the golden proportion, up to the first premolar11. This refers to the width of tooth visible, not the total width of the tooth. Although supported strongly by Levin, the golden proportion has been believed, by some, to be too strong for dental use in this way12. The golden proportion is to be compared to two other proportions, one slightly larger and one slightly smaller than it, and also to an irregular arrangement of upper anterior teeth which is deemed aesthetically appealing, for an upper arch, by an experienced dental technician. It was predicted that the golden proportion would not be chosen as being more attractive then any of the other set ups. To determine if the target population perceive the golden proportion to be most attractive arrangement of upper anterior teeth. To determine if age effects perception of aesthetics. To determine if occupation (with in the dental hospital) effects perception of aesthetics. To determine if gender effects perception of aesthetics. The Golden proportion is applied to the width of upper anterior teeth, as the amount of tooth visible from the labial axis, viewed directly in front of the midline. 4 Wax ups were prepared using pink beauty wax and acrylic teeth, of identical shade and mould, by an experienced dental technician at Liverpool University Dental Hospital. Shade used was A3.5, mould used was P21 manufactured by Heraeus Kulzer, Basic 6. The first wax up was prepared to the ratio of the golden proportion with the width of the central incisor in golden proportion to the width of the lateral incisor (1: 0.618) and the lateral incisor in golden proportion to the width of the canine and the canine in golden proportion to the width of the first premolar. The second wax up was prepared with the proportions of visible tooth decreasing by a value slightly greater then the golden proportion, the value of which was left to the discretion of the dental technician. The third wax up was prepared with the proportion of visible tooth decreasing by a value slightly less then the golden proportion. This value was also left to the discretion of the dental technician. The fourth wax up was prepared to an irregular arrangement, but one that was deemed aesthetically appealing by a dental technician. A lower wax up was also made for each upper arch, which fitted with the occlusion of the individual upper models. All models were made as identical as possible, using the same colour and mould of teeth, as well as the same colour of wax. The wax ups were mounted onto a stone cast, which was attached to an articulator for stability and reproducibility. Photographs of all of the models were then taken and formed into a questionnaire. The order of the four photos was randomised. Individuals were ask for their; age, gender, occupation and then to rank the photos in order from 1 through to 4, 1 being most attractive and 4 being least attractive. There was no time limit and on most occasions the questionnaire was left with the individual and handed in at a later time. The questionnaire was distributed anonymously to the student body within the University of Liverpool Dental School and to Staff with University of Liverpool occupational contracts. The view with the upper anterior teeth fixed to the Golden proportion will not be chosen as most aesthetically pleasing by any group of individuals. The view with the upper anterior teeth fixed to the Golden proportion, will be chosen as most aesthetically pleasing by the majority of groups of individuals. As non-parametric data was involved, it was decided to use the Mann-Whitney U significance test. However using this test we found the effect size was too small to show any significant difference. Power calculations showed that it is not viable to use post-hoc significance testing on the data collected. Therefore using statistical tests (through significance testing) the null hypothesis can neither by rejected or accepted. However using the raw data it is obvious that the golden proportion was chosen as least attractive by the majority of individuals compared to the 3 other varied arrangements, therefore resulting in the rejection of my null hypothesis. As stated in the introduction, it has been proposed by some individuals that the Golden proportion produces the most aesthetically pleasing arrangement of the upper anterior teeth. From careful analysis of my results, I feel this is not the case, as I believe aesthetics of this type can not be quantified in this manner. In my opinion aesthetics should be tailored for each individuals features, and although it is the easier route, simply to use a set template for each instance to achieve an aesthetically pleasing outcome, it is my thoughts that a better, more aesthetically pleasing result can be achieved by modifying each case for each individual situation. As explained in my method I felt the best approach to test my opinion was to create a questionnaire to compare the golden ratio with other arrangements. My results required non-parametric testing as the data was ranked in order of attractiveness. The most appropriate statistical test to use in this situation is the Mann- Whitney U significance test. Unfortunately the Mann-Whitney U significance test requires a substantial amount of data for it to show any significance. Given the time restrictions, it was not possible to obtain such large amounts of data. This is an area that could be improved upon if the study was to be reattempted. If the time frame could have been extended, a larger population could be targeted allowing the results to be analysed using the Mann-Whitney U significance test. Although no statistical test would allow me to test my null hypothesis, analysis of the results clearly indicates that the golden proportion was chosen as the least attractive set up by the majority participants. As shown in table 1 and graph 1, 65% of participants ranked the set up of teeth arranged to the ratio of slightly less than the golden proportion as most attractive and only 5% ranked the golden proportion as most attractive. Table 1 also shows that 56% of participants ranked the golden proportion as the least attractive arrangement. This shows the majority of individuals involved in this study thought the golden proportion set up did not appear the most attractive of all of the set-ups and conversely looked the least attractive. With regards to the second objective, to determine if age has an effect on perception of aesthetics, the results are tabulated in table 4. The uneven distribution of ages prevents any valid conclusions being drawn concerning differences in opinions of different age groups. The data is geared more towards the age group 21-35 years old. This is an area that could be greatly improved upon if the study was attempted again; a population with a larger variation of age ranges could be targeted. The results for objective 3, if occupation has an effect on perception of aesthetics are shown in table 5. The golden proportion was voted most favourable by 20% of technicians, 0% students and 0% of nurses. Although the data set is slightly skewed, should there be an opportunity to collect further results, I would look to find evidence to see if any relationship existed here. As technicians construct various appliances, and are regularly exposed to the design aspect with in dentistry, we could conclude that they are more likely then any other group to recognise and appreciate any relationship with respect to the Golden proportion. There are 38 results for the student population, 15 results for technicians and 2 results for nurses. The data collected is skewed towards the student population and there are not enough results from the two remaining populations for a conclusion to be drawn regarding effect of occupation on perception of aesthetics. Objective 4 assessed whether gender had any influence on the arrangement that was chosen as the most favourable. From the results one clear distinction is that a higher percentage of females then males chose the ratio less then the golden proportion as their first choice, although males did also rank this as their most favourable choice. The golden proportion was ranked as the least favourite by both groups, although a slightly higher percent of the female group ranked it as their least favourable. However as there were an uneven number of results from each group, it is difficult to reach a conclusion. The data not only supports my hypothesis showing the majority of this population believed the set up of the golden proportion to not be the most attractive arrangement of upper anterior teeth, but takes it one step further to say that the majority of participants thought the golden proportion was the least attractive arrangement of upper anterior teeth. If I was to extend this research project, I would increase the population size to include a more even divide of ages, occupations and genders. I would like to thank Dr L. Boyle for all his help with this project and Frank Shepard, Dental technician from L.U.D.H. for making the wax ups.